"Tax Reform: Ethics, Compliance, and Best Practices"
BEST VALUE! $300.00: Special Combination Ticket and New Membership Offer through Oct. 31 ONLY! AFP Membership is a great investment in your career and professional development that will benefit you AND your organization! Join by Oct. 31, 2018 and a generous sponsor will cover the cost of your NPD registration (an $85)! 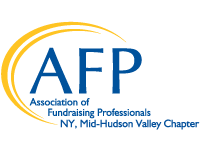 Don't delay - this is only available to the first 22 people who sign up for Mid-Hudson Valley AFP membership. For sponsor, vendor and journal ad opportunities click here.